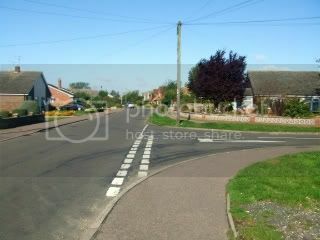 I took a look again recently at the website for Hethersett the village where I was born and grew up. The photos were particularly fascinating, especially as they were taken some time after I moved to Sheffield, so some things have changed, some are the same, and some I can't quite place. This is a view of St. David's Road: I was born at no7, moved away when about 2, and moved back to no 12 between the ages of 12-18. 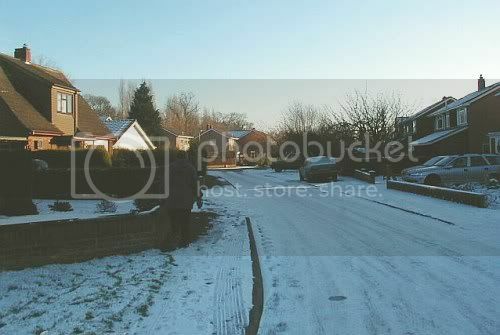 This is actually a pic of the short straight section between two sharp bends, first to the left and then the right as you drive up from New Road - the street is a cul-de-sac, so you can only enter from one end - by car, anyway. If the photographer had turned 90 degrees to his left, he would have been able to take a shot up the main length of the road. The house I was born in is on the right, the nearest to the camera. The house where I lived through high school isn't quite visible. You can see the curving garden wall to the left foreground. It is a corner plot, which meant our garden was out to the side, instead of to the back, like the other houses. My best friend, Lisa, lived on this road from the time I first knew her (aged about 4) till we were 18. So I used to come visit her even when I was living on the other side of the village, and knew this area well. This, as you can see from the signage, is Hethersett Library, a place I visited fairly often, shall we say. I remember that the entrance was to one side and that it was a 'modern' building, different to most in the village. I'd entirely forgotten about the one-way sloping roofs though. I guess the design is why I remembered it as unusual, if not the actual details. Only remembering it so vaguely is a little embarassing, as not only did I visit it about weekly on its own account, it shares a drive with the High School, so I passed it twice on every school day. The windowless bit out the front is, or was, the childrens section. This last one is a more general view: I think it's Recreation Road, or Park Lane, leading off Mill Road. I included it because it just seemed so typical of much of Hethersett. That low wall with the decorative concrete insets is very typical - a lot of houses have very 60's/70's gardens that barely seem to have changed since I roamed the village on my bike, looking for partially-set concrete foundations to walk on (I'm sure there's at least one house which has a set of mine and Lisa's footprints set in the floor under the lino). The strips of grass along the pavement are characteristic too. And just the look of the housing here. Hethersett expanded quite a lot in the 60's, so there's a certain style of house and bungalow that I associate with my childhood. There were older buildings too, but swathes of the village look a lot like this. Hehe I have no such romantic feelings about where I grew up in Manchester! If I never had to go there ever again I'd be quite happy!